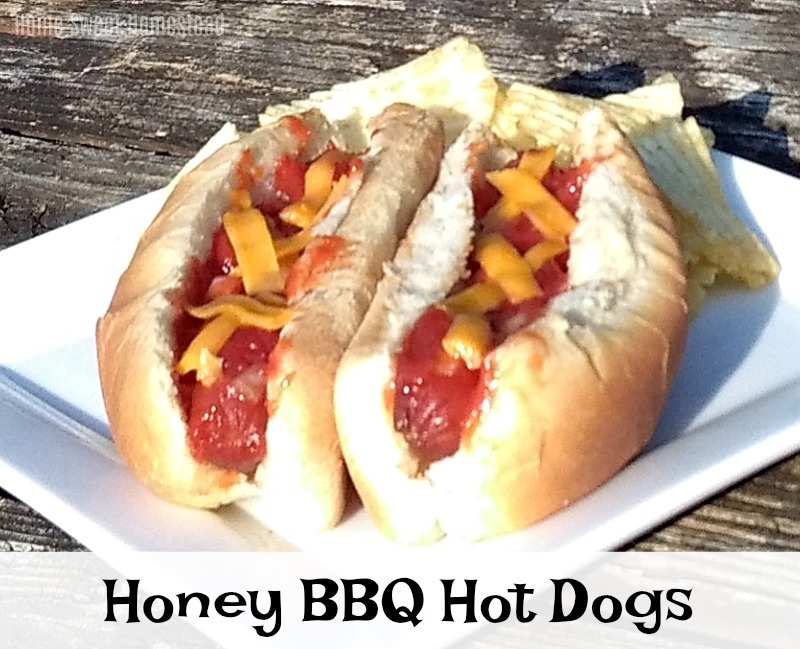 This easy crockpot recipe for Honey BBQ Hot Dogs, features hot dogs slow-simmered in a slightly sweet, homemade BBQ sauce, for a delicious twist on the humble, but versatile hot dog. My fellow #SundaySupper tastemakers and I, are celebrating National Hot Dog Month, by sharing our most creative hot dog recipes. No boring ketchup and mustard here! From tasty BBQ to yummy sides, there is no shortage of amazing hot dog recipes in this week's event. Go to any backyard cookout during the Summer, and you'll almost always see those ever popular hot dogs and hamburgers, sizzling on the grill. And for good reason. They're quick, easy, cheap, and appeal to everyone's taste-buds. Well now you can save that grill space for other things, (like my Grilled Corn with Fresh Garlic Butter and Lime) because these Honey BBQ Hot Dogs are cooked in a crockpot! They're super easy to make, and taste amazing. 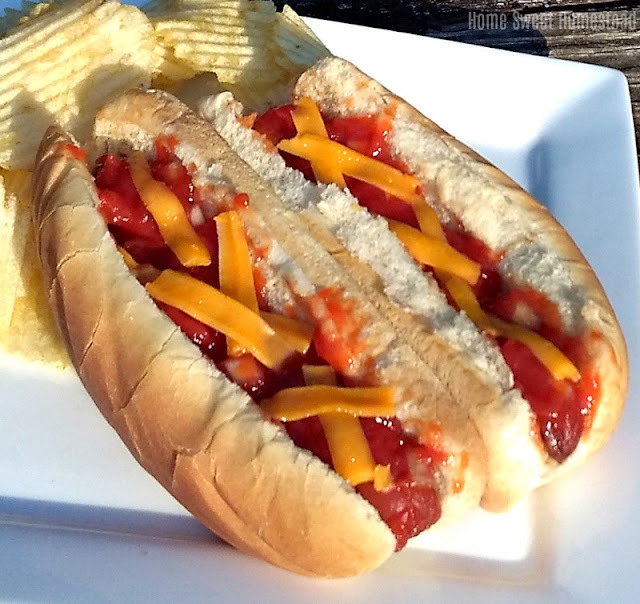 The BBQ sauce is homemade and slightly sweet, for a hot dog that is anything but average. Don't stop there though. Serve some of this tasty sauce as a condiment for your other entrees, like burgers or chicken. Your family and guests will love it! Many thanks to Stacy from Food Lust People Love, and Mary Ellen from Recipes Food and Cooking for hosting this event. In a bowl stir together ketchup, onion, brown sugar, honey, and mustard until blended. Pour about 1/4 of the ketchup mixture into the bottom of a crockpot. Place hot dogs on top of mixture, then cover with remaining mixture. Cover and cook on LOW for 4 - 6 hours. 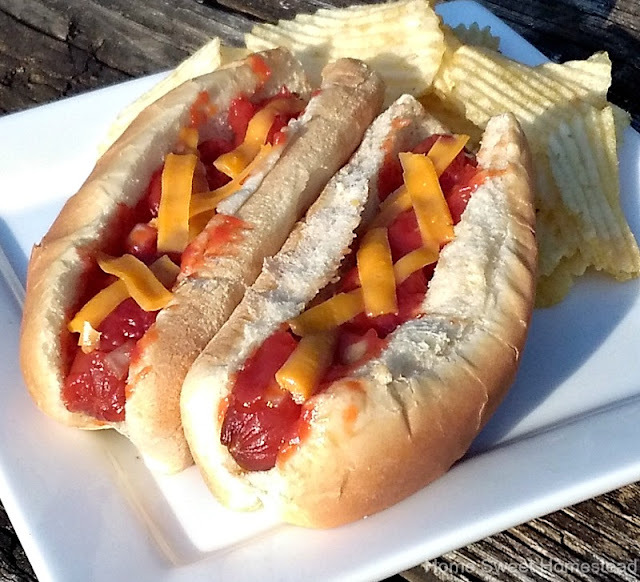 Serve on hot dog buns, with shredded cheese. Such a terrific idea for when you need hot dogs for a crowd. They look wonderful! I absolutely love how this is done in the slow cooker! 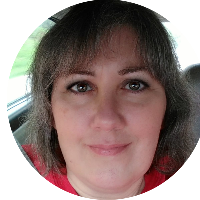 I love my slow cooker, and never thought about doing hot dogs in it! Definitely trying this one. I bet my kids are going to love it. The great thing about these is you can enjoy hot dogs year round. this is SUCH a great idea for feeding a crowd--I love it April!